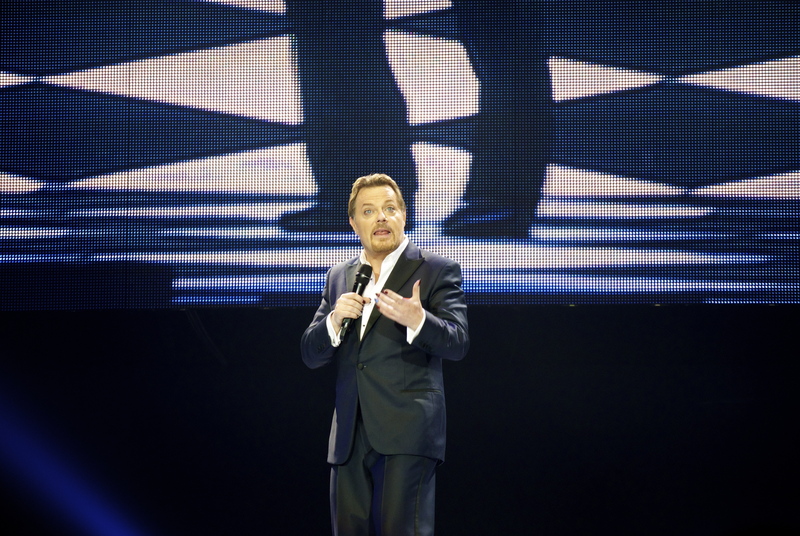 In June last year, me and my very successful F5* finger snagged 8th row seats at Wembley Arena for Eddie Izzard on his Force Majeure tour. It feels like I’ve been waiting a very long time, so even getting drenched on the way from the tube station didn’t dampen (lol) my spirits. I have been a fan of Eddie for half my life. He was a revelation to me. I remember being in Bracknell MVC aged 16 and seeing this green VHS box. I was drawn to it for some reason, and when I opened the box and found a gold cassette inside, I knew I had to have it. I don’t think I had ever laughed as much in my entire life as I did watching that show. I first saw him live on the Circle tour in Brixton and almost fell off my chair into the aisle laughing. And I’ve seen him on every tour since. Technically, I’ve seen his Stripped material 4 times (or is it 5?). And I was lucky enough to see him in Lenny and The Day in the Death of Joe Egg in the theatre. I think Eddie has earned his right to be my hero. Force Majeure is really good. A smile never left my face. Someone commented that he was a bit rambley, but that’s how I like him. And I always love his theories on life and religion. And being in the 8th row was AMAZING! Eddie was Eddie. If you don’t get him, you never will, and if you do get him, you’ll love this show. *My F5 finger is legendary at getting us good tickets. I’ve got amazing seats for Eddie before, as well as Flight of the Conchords and a night at A Room for London. If you want good tickets, I’m your girl.